Mens 4.0 Tennis Group plays M,W, F afternoons throughout the summer. Vacationers, guests and members of all ages and levels are welcomed. 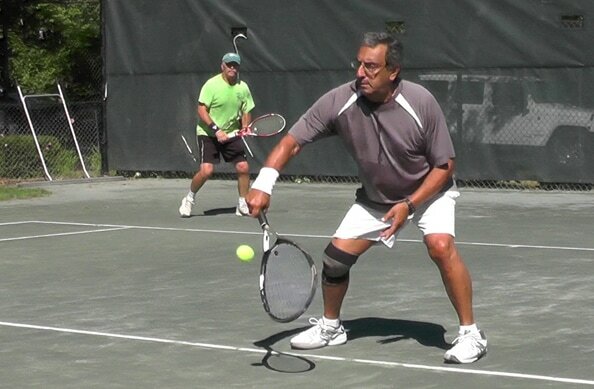 If you are a player of just learning to hit, there's a way for you to play at the South Yarmouth Tennis Club. $40 ($20 each) for 1 1/2 hours of singles based on availability. $60 ($15 each) for 1 1/2 hours of doubles based on availability. Reserve courts day of or 1 day before play. Family Membership $680/year – Unlimited play with no court fees, full reservation rights, guest privileges, voting privileges. Individual Membership $360/year – Unlimited play with no court fees, full reservation rights, guest privileges, voting privileges. Family Membership $875/ year - Unlimited play with no court fees, guest privileges and full reservation rights. Individual Membership $475/year - Unlimited play with no court fees, guest privileges and full reservation rights. $250/year - Play seven days a week after 4 PM weekdays and noon or after on Saturday and Sunday, no court fees. Reserve courts day of or 1 day ahead. Guest privileges - May bring guest for $20/play.....limited to 5X per year for same guest.